We are about to enter a busy competition season, so we thought it would be a good time for a “How to Knox” blog post! If you are new to knoxing, or just need some refresher tips, take a look below. Our 13-15 Age Group team was kind enough to let us watch while they knoxed for their first routine meet of the year. By knoxing their hair, synchronized swimmers keep their hair in perfect place throughout a routine. Why do synchronized swimmers knox their hair? To keep it in perfect place while swimming a competition routine. It is only done when swimming routines at meets. At ordinary practices, or for figures only, synchronized swimmers wear caps. Do you mean “Knox” as in the gelatin product you buy at a grocery store? Yep! The same thing! It’s pretty gooey when it goes on, but it dries nicely to keep the hair in place. And it’ll stay put throughout a day because the water in pools is usually only about 80 – 84 degrees, not hot enough to melt the knox. How do the girls get it out? It takes a nice, long hot shower after the meet is over to dissolve the knox away. Tip for success: Some girls like to use conditioner to keep the hair detangled while getting all the knox out. Tip for success: Many girls like to build a little kit of supplies with the following items. That way, everything is right there for every meet – no tedious searching around. Good knox starts with a tight ponytail. 2. Pull the hair into a tight ponytail and secure with an elastic. This step is critical! The tighter the initial ponytail, the smoother, and prettier the knox will be. Tip for success: Dampen the hair to minimize flyaways and smooth out the hair from the start. 3. Make a bun with the ponytail. Option 1 for thicker hair, split ponytail into two sections, then wrap each into the bun. For thin hair, simply twist the ponytail in one section until it naturally falls into a bun coil. Secure the end with a bobby pin. Option 1 for thicker hair: Split the ponytail into two pieces. Twist each section in opposite directions. Coil one section around into a bun shape, securing the end with a bobby pin. Then coil the other section around in the opposite way, securing that end with a bobby pin also. Option 2 for thicker hair: make either 2 or 3 braids before wrapping bun. Option 2 for thicker hair: Split the hair into two or three sections and braid each section. Wrap each piece around into a bun coil, securing each end with a bobby pin. Wrap the hair net around the bun. It will go around 2-3 times. Secure bun with bobby pins. Overlap bobby pins at the base of the bun for stability. You should be able to tug on the bun and know that it is secure at this point. Use hairpins down the center if desired for thick hair. Please note: some parents will put the hair net on first, then lock down the bun with bobby pins; others will lock it down without the net, then add the net. If hair has started to dry out, give it a spritz all around and smooth it down with your hand or a comb. Tip for success: Be especially careful to dampen and smooth all the little wisps of hair that collect at that base of the neck and forehead. Dampen and comb up all the little wisps before knoxing. Now, get ready to knox! Tip for success: The hotter the better; a hotpot will be fine; the coffee maker typically found in hotels for travel meets will be fine too. 5. Empty 3 or 4 knox packages into cup. Use 3 packages for younger athletes and for those with thin hair; most everyone else will be fine with 4 packages, though we know of some swimmers who use more than that. 6. Pour the hot water into the cup with the knox and mix. 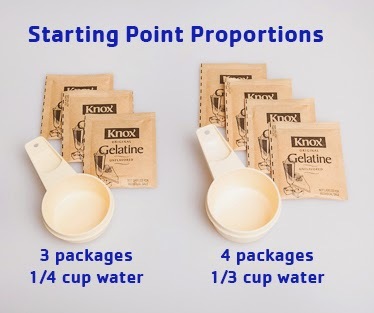 Until you know and can eyeball the right consistency of the knox, try these ratios: ¼ cup water for 3 packages knox; 1/3 cup water for 4 packages. With experience, you'll be able to eyeball the knox for the right consistency. you try to fine tune the mixture after the first mix, and no one wants to be that girl with the clumpy knox! If you need more, simply mix up a new batch. 7. Starting at the center of the forehead, comb a layer of knox into the hair. Dip your comb into the cup of liquid knox and comb it in. Working quickly, go all around the head with the comb, dipping the comb in for more knox with each new section of hair. Comb in a layer of knox all around the head. Tip for success: Dampen a corner of your smaller towel with hot water before starting this step; this will be good for catching any drips of hot knox that fall on ears or exposed necks. 8. Next, dip your paint or pastry brush into the liquid knox and paint it on the surface of the hair. Paint the knox on the hair with a paint or pastry brush. 9. When you’ve gone all the way around the head with the brush, use the last part of the liquid knox to paint the bun. The bun is the last thing to paint. 10. Let the hair dry for about 10 minutes, and pin the headpiece on. The hair will be just gooey enough to easily put the bobby pins in to secure the headpiece. Pin headpiece on before knox dries. Tip for success: If you wait too long, the knox will dry hard and it will be very difficult to get the headpiece in.